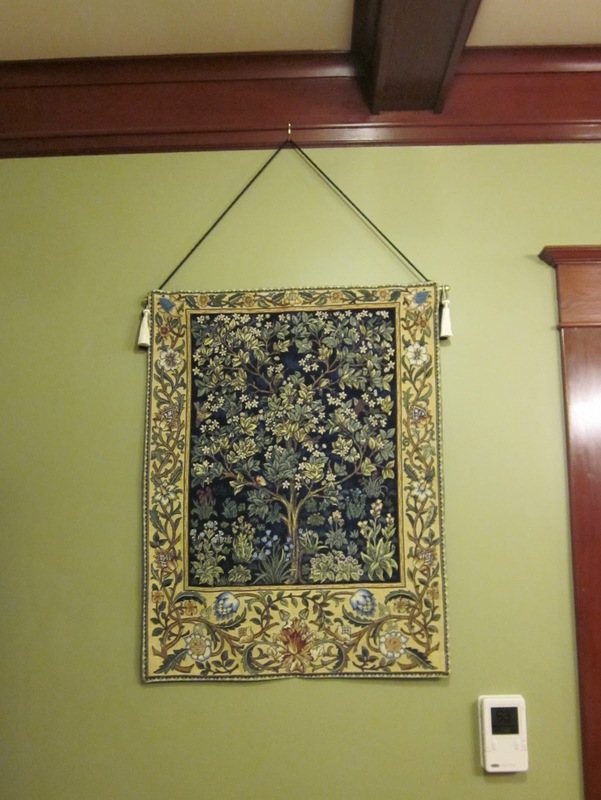 When Sharon ordered the rug the other day on Overstock.com, she found this inexpensive Tree of Life tapestry, which she ordered. Today, she made it off to JoAnn fabrics to buy an inexpensive cafe rod to get it hung up. This particular tapestry design was done by John Henry Dearle, of Morris & Co., in 1910. On another topic, isn't that plastic thermostat controller ugly? That's thanks to our contractor and their sub-contractor, Pyramid Heating & Cooling. Sharon pretty much flipped out when she saw this awful thing on the wall. They never bothered to mention this ugly thing would be installed. If they had, we would have moved the wiring to a less-visible location. They tell us we can't cover it, because it has to be exposed to the air to work. There's gotta be some kind of brass lacework box or something you can put over it that would at least disguise it. Like a small wall sconce or artsy decor. Either that or see if you can replace the unit with something less obtrusive. Nice banner, though. Paint that thing either the same color as the wall, or maybe a bronze-ish tone. Camouflage it.